I have been haunted of late by a puree of zucchini, green chiles, and hemp seeds that would make a wonderful soup, but I wondered if I could justify making yet more soup when I still had a pot of the beet, tomato, and red chile soup I had made a few days earlier. 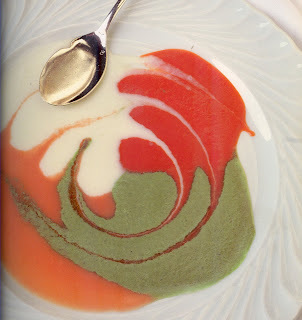 Then I remembered that photo in The Natural Cuisine of Georges Blanc—you know the one I mean, the one where he serves four pureed vegetable soups together. Wow, I do like that picture. The four vegetables seen in their pureed forms above are string beans, tomatoes, red pepper, and celeriac. I would really like to make all four someday. I would like even more to make a fifth, because I especially like the look of a plate with five elements on it. Purple potato, yellow carrot, something like that. Anyway, so far I am only up to two soups at one time. This presentation is a bit easier if your soups are on the thicker side but not too thick (I know, it’s hard to get the thickness just right), and if both soups are close to the same consistency. Both of these dairy-free soups get their satiny creaminess from pureed hemp seeds. Heat the oil in a large soup kettle. Add the onion, garlic and peppers and cook unitl thoroughly relaxed. Add the zucchini, beet greens, hemp seeds and cashews and continue to stir and cook several minutes more. Add 2 quarts of water and two teaspoons slat and bring to the boil. Cook until the vegetables and nuts are quite tender. Remove from heat and add the herbs. 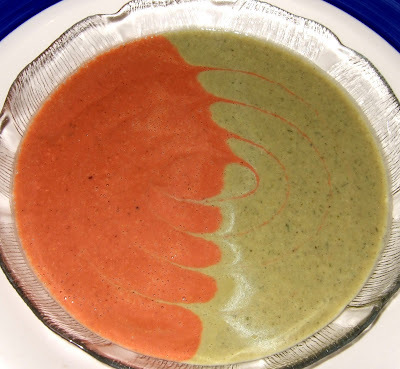 Puree the soup in batches in a blender or using the pureeing-modality of your choice. This soup is just perfect as is, but if you happen to have some beet, tomato and red chile puree (recipe pending) on hand, pour a little of each soup into a shallow soup plate and swoop a little spiral on the surface with a spoon. Ah, that’s nice. This recipe is my submission for Jihva for Chillies. The final fiery roundup by Nandita is to be found at Saffron Trail. Looks like a delicious entry to the roundup. Great way to use up all those zucchini langushing in the garden!! Love the picture and the recipe!